In the year since she got married, she’s been spotted pushing a cart in the grocery store parking lot and walking with her new dog in the park. She’s been seen browsing through pillows and bed linens in a department store and bought her husband black boxer shorts for Valentine’s Day. Ordinary enough, you could say, for pretty much anyone. Except in this case, it’s the Duchess of Cambridge. 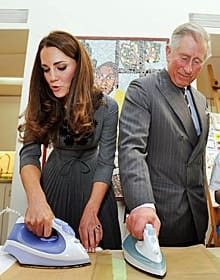 While there have been those glimpses of everyday life, there have also been pictures of Kate — in Canada and elsewhere — looking glamorous and every inch a member of the Royal Family she joined with her marriage to Prince William on April 29, 2011.